Welcome to the digital edition of the July issue. 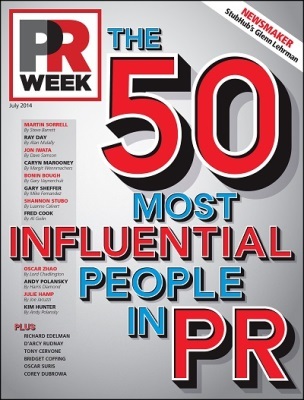 • Power List – PRWeek chose 50 power players who are redefining the new role of communications, PR, and marketing and elevating their brands to the highest levels of market leadership. This elite list of game changers reaches across top brands and agencies. This section highlights how these communicators have skillfully steered brands through opportunities and challenges and, in a new twist this year; some of these innovative leaders are being profiled by their industry peers. • Public affairs roundtable - Whether it is the challenges of getting legislation passed, the increasingly diverse nature of the US population, or social media’s continuing prevalence in everyday lives, the job of the public affairs pro continues to evolve on a daily basis. Industry leaders from the US Chamber of Commerce, Siemens, and the AARP convened for a roundtable to discuss these topics and more at the National Press Club in Washington, DC. • CEO Q&A - American Standard’s Jay Gould discusses improving staff morale and how the company’s philanthropic efforts helped increase sales. • City spotlight - Roger Ringwood, MD at Smart Brands International, says there is growing demand for well-executed digital and traditional comms efforts in Sydney. Janet Tyler, cofounder and co-CEO of Airfoil, discusses how an influx of entrepreneurs and hard work helped Detroit fight back from bankruptcy. Download this digital edition now.